The Drosophila ovary has proven to be an excellent model system for addressing many key questions in biology. Among these are questions relating to the cell cycle control of DNA replication and chromosome structure during development. 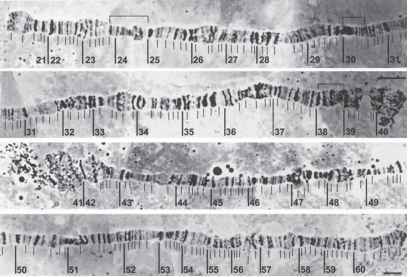 Early studies of ovarian chromosome dynamics employed various histochemical stains and bright-field microscopy (1). Later, photometric cytometry, 3H-thymidine incorporation, and radioactive in situ DNA hybridization were used to study DNA replication and chromatin organization within the ovary (2-5). Recently, the introduction of fluorescent detection has significantly improved the ability to study chromosome dynamics and DNA replication in the developing ovary (6-8). In this chapter, we describe two techniques based on fluorescent detection, BrdU labeling and nuclear flow sorting, that have recently been applied to the study of oogenesis. These techniques allow visualization of DNA replication with high resolution by epifluorescence microscopy and accurate measurement of DNA copy number during endo-cycles of the ovary. We first briefly review the current understanding of cell cycle and chromosome modifications during oogenesis to which these techniques have contributed. For more detailed accounts of oogenesis, the interested reader is referred to previous reviews (9-11).